Flipbooks Help Prisoners Stay Connected To Their Loved Ones : All Tech Considered For people in prison, rules limiting access to technology make seeing video of their kids' first steps difficult. But a Colorado woman is using a 19th century solution for this 21st century problem. Artist and flipbooked.com founder Liza Tudor thumbs through "1st Steps," a flipbook of Nicole Garrens' son Zander's first steps. Tudor sent the flipbook to Garrens' husband, Roy, who's currently incarcerated in Texas. For families spread out across the country, videos and video chats have become a meaningful way to share a baby's first steps, a birthday party or a loved one blowing a kiss. But for people in prison, rules limiting access to the Internet and cameras can make sharing these moments difficult. In Colorado Springs, an artist came up with a creative solution. Like many proud parents, Nicole Garrens captured her son Zander's first steps on her cellphone. She wanted to share the video with her husband, Roy, but he recently went to prison in Texas. "The last time he saw him he was between five and six months, and you know, he was crawling, and kind of standing up holding onto things," Garrens says. "But when a baby starts to walk, it's one of their biggest milestones, and it breaks my heart to know what he's missing." Garrens moved to Florida after Roy was incarcerated, so she could be near her family. But she wanted to figure out a way for her husband to see the video. "You know, pictures can only say so much," Garrens says. "They're still pictures." While almost anyone with a smartphone can send or receive short videos these days, prisoners still have little access to technology. So Garrens went looking online for a creative solution. She found flipbooked.com, a small company that turns short videos into flipbooks. The company's founder is Colorado Springs artist Liza Tudor. For her, this 19th century technology was the perfect solution to a 21st century problem. Tudor's ex-boyfriend had gone to prison, and she wanted to send him a video. "We had a dog that we'd gotten together and she was getting really old," Tudor says. "Her name was Nala. And she was 13, and I was worried she was going to die soon, which she did. So I took a video of her giving me some kisses." Before long, Tudor had written her own software to turn short videos into flipbooks. "I've programmed to break it into frames and essentially lay it out in a contact sheet," Tudor says. It looks like a sheet of stamps. She prints the images out, tears the paper along perforations and stacks them by number. 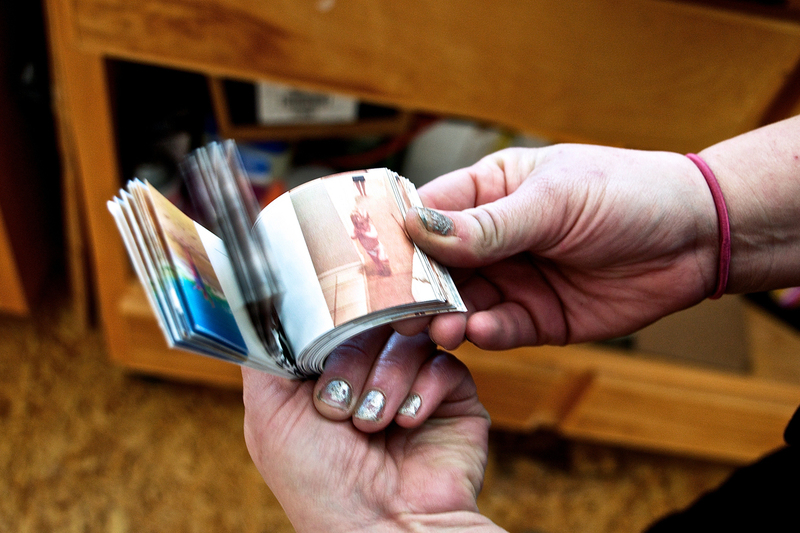 When Tudor sends flipbooks to prisoners she just sends the printout in an envelope. The prisoners assemble the books themselves. Tudor's ex-boyfriend, Nick Wells, has been at the Limon Correctional Facility in eastern Colorado since 2011. He remembers when he got that first flipbook three years ago. "The next thing I know, I'm in my cell, and I get mail ... and I saw my dog running around acting crazy, and it made me laugh," Wells says. "It brought the biggest smile to my face." Tudor also sent him a flipbook of his young nephew. "Being able to see him walk for the first time was just heartbreaking, at the same time ... overwhelming sense of joy," Wells says. "I get to be a part of that. When you look back at your life, those are the moments, these little tiny things, you know." And those tiny moments aren't just about toddlers. Lori Kuhn lives in Los Angeles. She turned to Flip Booked with a video of her godson tying his tie for the first time. "There are many milestones, and learning to tie your first tie something typically that your father teaches you," Kuhn says. Her godson's dad, Wayne Boatright, is currently serving a 7-year sentence in San Quentin. He was overjoyed. "It's beautiful," Kuhn says. "It's heartbreaking. I can't even put it in words. I'm glad I was there to capture it and share it with Wayne." Even if it becomes easier to send personal videos directly to prisoners, Flip Booked users say there's something magic about being able to hold a little bit of time in your hands.